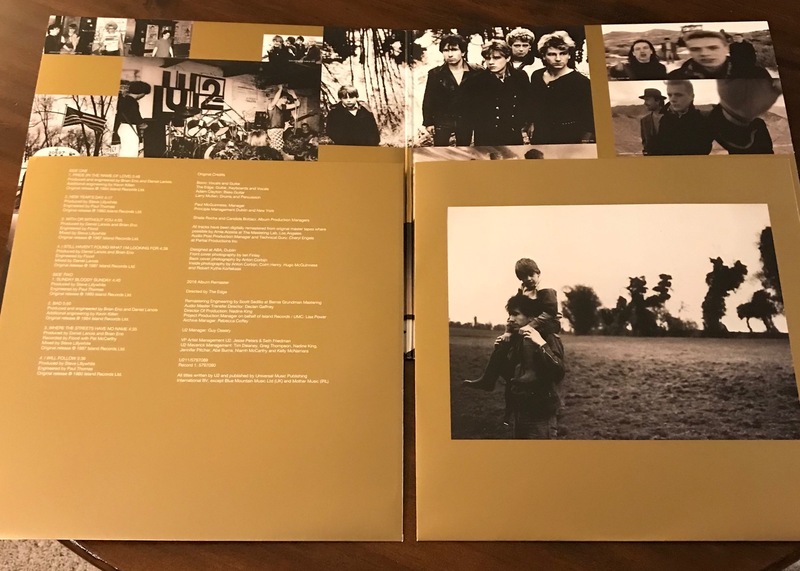 Back in April, U2 reissued a trio of albums – Wide Awake In America, Pop, and All That You Can’t Leave Behind – that spanned an impressively adventurous 15-year section of their career. All three albums were brilliantly remastered, pressed on heavyweight vinyl, and packaged with an extra attention to detail that made for a brilliant finished product that shined both musically and visually. 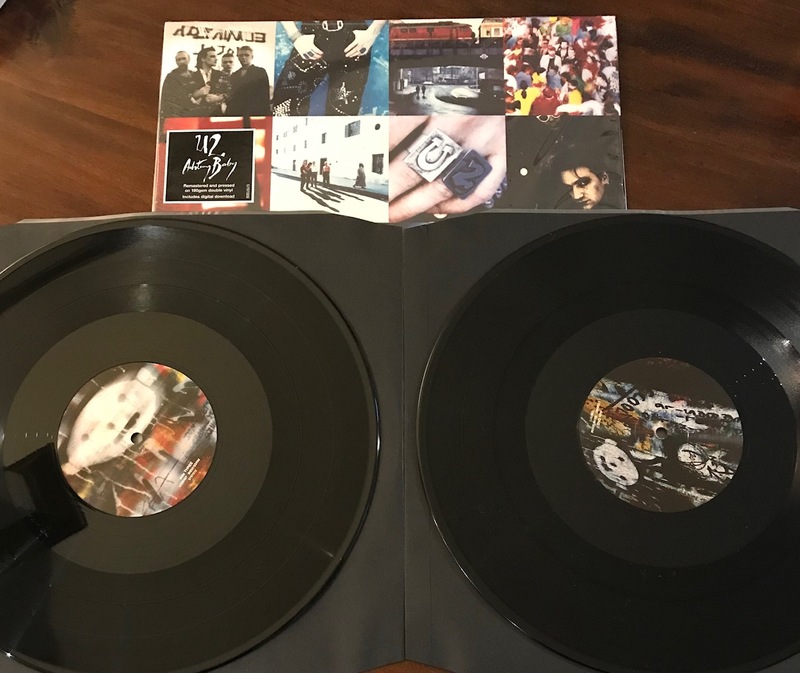 Looking to strike twice with the same well-crafted formula, this month finds the band releasing another trio of vinyl reissues – Achtung Baby, Zooropa, and The Best of 1980-1990 – that have been handled with the same care and craft to make this batch boast an equal “must have” aesthetic. While the first trio of reissues felt like three different snapshots of the band’s multi-persona arc, this newest trio of reissues reflects a more compacted section of their career, specifically the experimental build-up and return-to-form release of their ‘90s output. Achtung Baby was originally released in November of 1991, Zooropa followed closely behind just a year and a half later in July of 1993, and The Best of 1980-1990 (originally released in November of 1998) – while understandably a greatest hits project – served as a nice reminder of the band’s ‘80s musical dominance after the backlash they received from 1997’s largely misunderstood Pop. Taken together, the three releases transport listeners back to a time where U2 tried to test as many boundaries as they could on record and in concert to see how far fans would travel with them, pretty much found the tipping point with Pop, and then reset the playing field with their first ever greatest hits package. 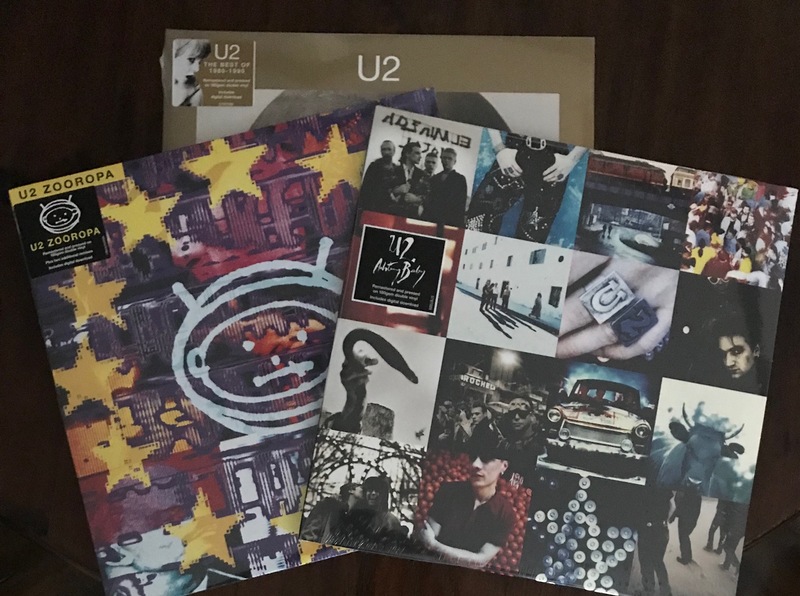 It was a great time to be a U2 fan and these gorgeous vinyl reissues serve as both a reminder of their fearless creativity and a heavy-duty upgrade to your record collection. Achtung Baby not only has the distinction of being the album that had to somehow follow the monster smash of The Joshua Tree (Rattle and Hum doesn’t count as a proper complete studio album), but it has also been a bit of a white whale for many U2 fans looking to own a vinyl copy of the album. 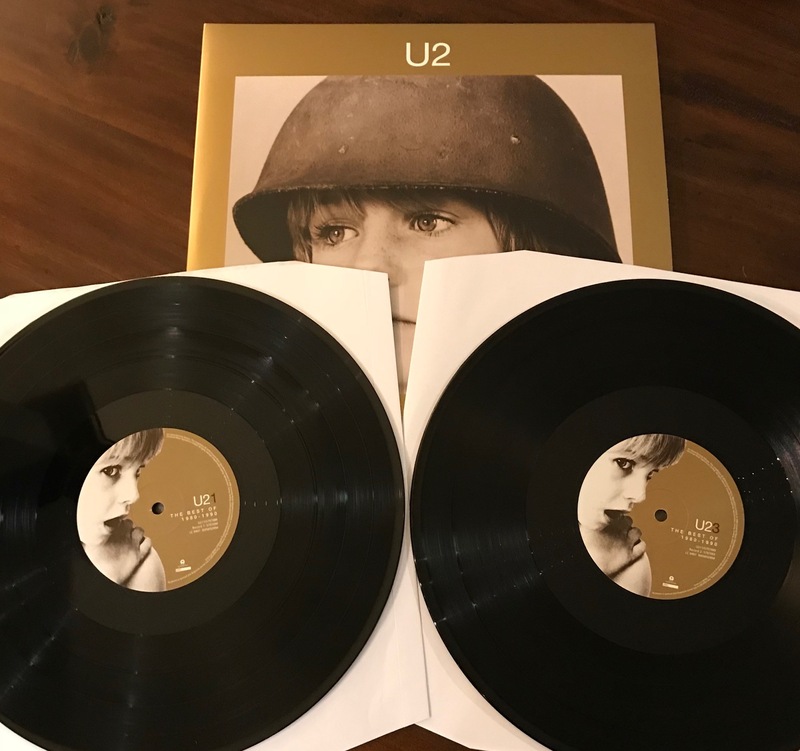 Original first-run pressings from 1991 have often fetched triple digits on the secondary market. This new reissue will help remedy that situation for many fans and it does so with impressive touches that could actually enhance the overall experience above the original pressings. 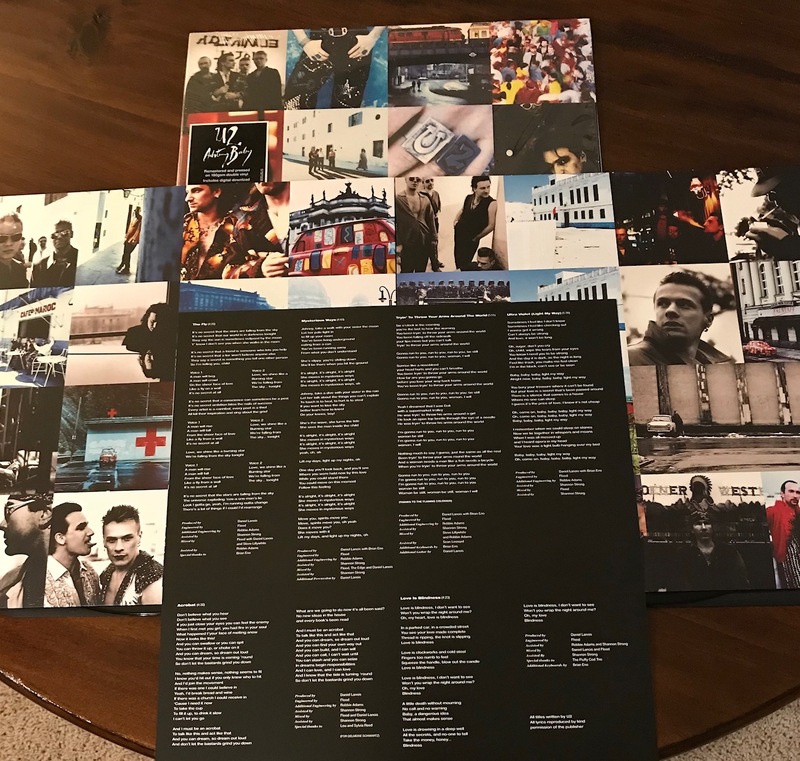 This new Achtung Baby reissue features completely remastered audio spread out over two discs of 180g heavyweight vinyl and features strikingly beautiful collaged picture sleeves to house the records. There’s also a nice standalone lyric sheet insert and a download card for all 12 tracks. For pure existence alone, Achtung Baby may end up being the standout pick of the trio for most fans. After the widespread success of Achtung Baby and the critical buzz of the accompanying Zoo TV tour, audiences welcomed the newest incarnation of U2 so warmly that the band experimented even further (and quicker) with Zooropa – recording the album in short six week session in early 1993. This year marks the 25th anniversary of the album release, so this vinyl reissue goes a little further with the extras – as it’s presented for the very first time as a double LP and it features two bonus remixes making up the fourth side: “Lemon” (The Perfecto Mix) and “Numb” (Gimme Some More Dignity Mix). This one is my personal standout of the batch due to the remastered audio being given more space across two discs and getting the two incredibly cool remixes on vinyl. Plus, the artwork on the cover and on the internal picture sleeves pop so crisply in this layout that it’s easy to get lost in the visuals as the music is transporting you. That may sound a bit clichéd but it’s totally true in the case of this reissue. 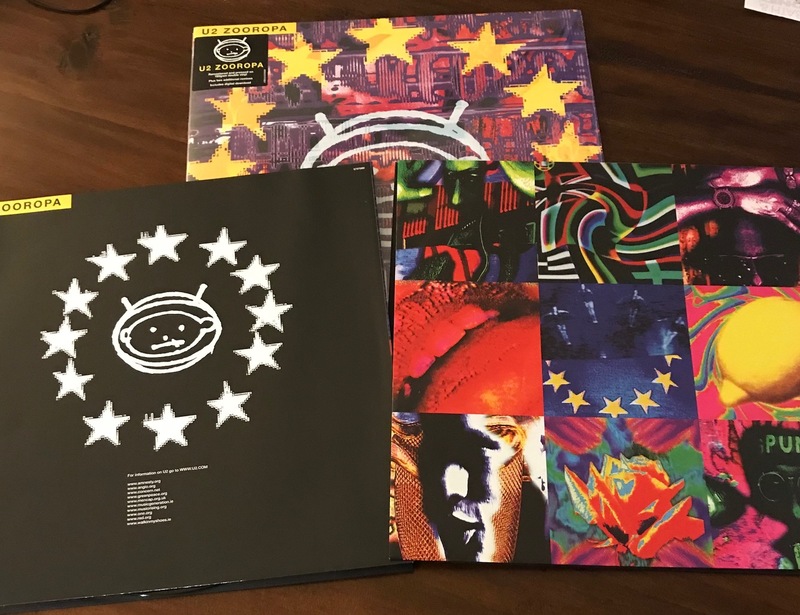 If you only pick up one of the batch, my gentle nudge is towards Zooropa. How you end up feeling about the reissue of The Best of 1980-1990 is probably dependent upon how you feel about greatest hits packages in general. But make no mistake about it; U2 is a band that not only earned the right to release a greatest hits album, but they also did it in a way that allowed them to be split across decades. The Best of 1980-1990 covers the band’s first decade and includes many of their biggest and farthest-reaching hits from War, The Unforgettable Fire, and The Joshua Tree. 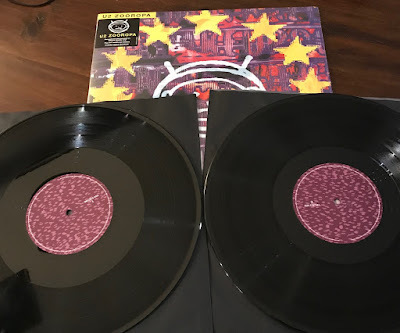 Originally released in late 1998, the album served to remind longtime fans of what they loved most about the band throughout the ‘80s (especially if the were having trouble following the Zooropa/Pop trajectory) and it helped bring younger fans they garnered from their newer electronic/alternative/semi-industrial elements up to speed on the band’s previous output. It was a certifiable win-win and the album functions as one of the few greatest hits releases that doesn’t feel like a cash-grab retread. This vinyl reissue of The Best of 1980-1990 is remastered, pressed on two 180g vinyl discs, and housed in a fantastic gatefold outer sleeve with gorgeously printed inner sleeves. Much like the reissue of Wide Awake in America from the earlier batch of reissues, the starkness of The Best of 1980-1990 proves to be an arresting foil against that vibrant aesthetics of the other two releases. 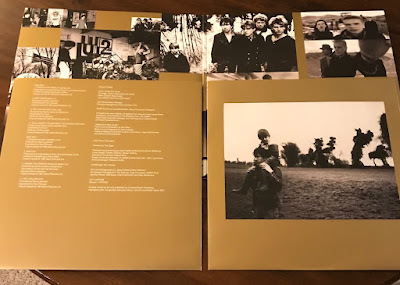 The black-and-white photos chronicling the band’s early career contrast really nicely against the gold background splashes and it all works together to set the right context for the compilation of songs. The vinyl reissues of Achtung Baby, Zooropa, and The Best of 1980-1990 have all been remastered, pressed on 180g vinyl, and include a download card for the songs on each album. You can order them all individually here.